These tags can also be inserted into content sections on your pages. Can be used as a tagline or keyword list for individual pages. You can now add codes to your templates that will insert custom keyword and description meta tags to the pages of your blog. 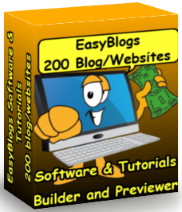 EasyBlogs is 2 editors in one. The 'Template' editor is an HTML code editor that pages are built with. The 'Blog Entry' editor is used to add content to webspages and blogs. When you click 'generate pages' the template and content are compiled. Thus inserting your article meta tags into your pages. - default pages - i.e. blog page, recent entries. - archive entry - daily, weekly or monthly and sub-category pages. - static pages - are tier 2 pages and appear in the navigation but not in the blog page. - hidden page - does not appear in navigation, blog, archive or category pages. - recent entries page - blog page if used separately from home page. - free format pages - do not appear in navigation. But, in order to have the keyword tags automatically filled with information that you provide, you will need to code your blog templates using this tutorial. But, before we begin, if you're not sure which template you are currently using in your blog, go to 'Options' tab then ''Choose Template' option and what is currently selected in the "Current Template" field. Make a note of the template you are using. This is the template you will be modifying in the following steps. Step 1. 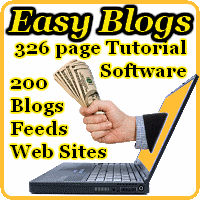 Open the Easy Blogs software and on the side menu, click on "Template Editor." Note: If you are already in the software, click on "All my Blogs," on the side menu to get to this screen. Step 2. Click on "Open". Step 3. Select your template from the options prestented. 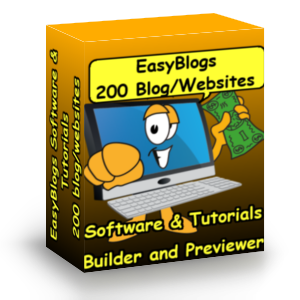 A window opens in the Easy Blogs Folder where the templates are stored. Find the template that you have previously chosen and downloaded for your News Blog in TUTORIAL I : Downloading Your SBI Customized Template. Double click on the template starting with "sbi." Step 4. Click on the Default Layout button on the left. Notice that the "Default Layout" indicated in the box to the right which says, "Default Template" (circled in red below). Step 7. Now. be sure to do the same for your home page. Click on the "Home Page" Tab on the left. Click on "Start of Page"
That's it you are done. Be sure to click Save in the top menu bar to save your insertions. Step 8. Now. be sure to do the same for your article pages. Click on the "Article Pages" Tab on the left. Note: IF you want to add more than just meta tags to your article pages including adding Adsense, autodiscovery and/or comments, see the tutorial, How To Code The Article Pages of Your Template To Include Meta tags and Google Adsense in the Body Of Your Article, plus add comments and autodiscovery to your articles, too! Step 9. Now, you have to setup your customized article meta tags content. Go to Options and find the button, Custom Variables. Here you will insert your primary and some secondary keywords in the "Default Keywords Meta Tag" box and a descriptive sentence containing your site's themed primary keyword phrase in the "Default Descriptions Meta Tag" box.....just like you do when using Page Builder! Click Save in the top menu bar and close. Remember that these meta tags go into a lot of pages. When you use a "Default Page" they get these meta tags inserted. This is convenient way to get these tags filled in. When you create an "Article Page" Easy Blogs uses the meta tags that you fill in on the "Blog Entry" window. Easy Blogs will look on your "Blog Entry" page for these tags to be filled in first. 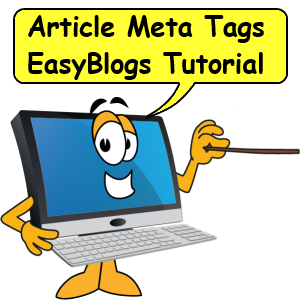 If EB doesn't find an entry in the "Meta Tags" section or your "Blog Entry" it will use the "Default Meta Tags." in the 'Custom Variables' area of the dashboard. What does that mean? When creating articles you can use the "Default" tags if you like. Or, you can fill in the "Meta Tags" section in the "Blog Entry" section for better search engine optimization. Either way you need to do this procedure to make sure every page you publish has the meta tags filled in. a) re-publish, re-generate your pages in the blog software. b) re-upload ALL affected pages of your blog to your SBI site. Be sure to do this after you complete the steps of this tutorial. That wraps up the article meta tags tutorial.